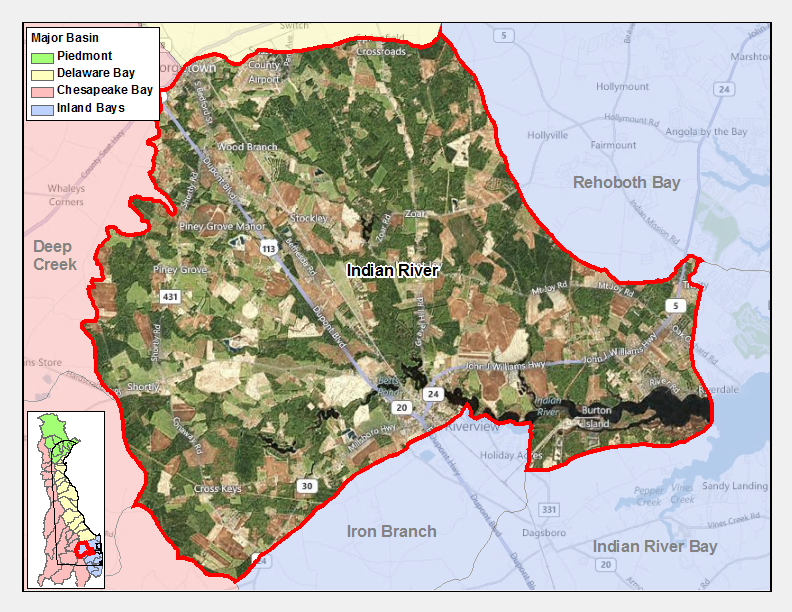 Indian River Bay watershed makes up one of three of Delaware's Inland Bays. The Inland Bays consist of three interconnected bodies of water - Rehoboth Bay, Indian River Bay, and Little Assawoman Bay - all located in southeastern Sussex County that are further divided into subwatersheds. 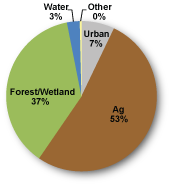 There are nutrient and bacteria TMDLs for the Indian River Watershed which requires a 65% reduction in phosphorus in the upper tributaries, an 85% reduction in nitrogen in the upper tributaries, a 40% reduction in nitrogen and phosphorus to all other tributaries, 40% reduction in freshwater nonpoint bacteria, 23% reduction in marine nonpoint bacteria, and a cap on point source bacteria at a geometric mean concentration level of 35 CFU enterococcus/100mL until all point sources are eliminated as required in the 1998 Inland Bays Nutrient TMDL Regulation. The Indian River Generating Station has a Temperature TMDL that calls for an energy wasteload allocation of 1.26 x 106 BTU/day for the months of October through May and temperature allocations of no increase in daily mean ambient temperature above 84 degrees F in June through September. The Indian River Watershed has twelve sites listed in the Site Investigation and Restoration Section database. Eight sites are state-fund lead (HSCA) sites, one Brownfield program site, one site in the Voluntary Cleanup Program (VCP), one site that has undergone a preliminary assessment / site inspection (PA/SI), and one site listed as a Formerly Used Defense Sites (FUDS). Each of the sites is sampled through the program listed above for a consistent suite of environmental contaminants. These contaminants are broadly classified as Volatile Organic Compounds (VOCs), Semi-Volatile Organic Compounds (SVOCs), Pesticides, Polychlorinated Biphenyls (PCBs) and Metals as listed using USEPA and DNREC defined standards. When sites are adjacent to water bodies sediment samples are collected to assess potential impact from a site on the health of the waters. If you would like to view reports for any of the sites in the SIRS program please follow the link the DNREC Environmental Navigator to search by map for the Indian River Watershed. Soils include predominantly Evesboro-Rumford association, described by Natural Resources Conservation Service as "excessively drained and somewhat excessively drained soils that have rapidly permeable subsoil of sandy and sandy loam." There are very gentle slopes overall. Much of the land below Millsboro lies within 20 feet of sea level.